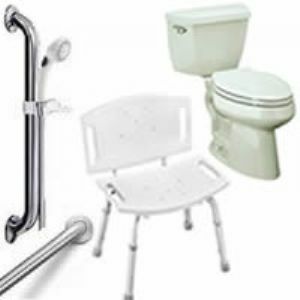 2 Moen Peened Grab Bars any size, 12" 18" 24" 32"
1 KOHLER Cimarron comfort height 2 piece round bowl in white or the KOHLER Highline comfort height 2 piece elongated toilet in white. This is a savings of $215.00 off the normal price! The 17 in. bowl height of Highline Comfort Height toilet bowl is the same height as a standard chair to provide maximum comfort. This model features Class Five flushing system with an elongated toilet bowl design.